1. No food is "good" or "bad"
"Mom can have another cookie?" "Then no, too many cookies are bad for you." Or similarly, "too much candy is bad for you." Conversely, "Eat your broccoli! It's good for you!" Think about food in your adult life. Have you ever found yourself thinking, "I shouldn't eat this ice cream...it's so bad for me!" And then you eat it, and then you feel a little guilty about it or regret it completely. Why? Because you labeled that food as bad- you attached an emotion to it. When we say certain foods are good while others are bad, we attach positive feelings to healthy foods and negative feelings to unhealthier foods. We essentially shame ourselves for eating foods less nutritionally dense because we've labeled it as "bad". Your brain then makes the very small step to think, "I ate that, I'm bad." Or, in the very least, "I'm feeling bad about myself." Ever offer a girlfriend a treat and hear "Ohhh I shouldn't!"? Or maybe you're with a group of friends at dinner and you hear "I shouldn't have eaten that cheesecake!" or "We'll work it off tomorrow!" or "I've been so bad this week!" Seriously- next time you're with girls around food just listen. I can tell you at least 4 separate times I've heard something to that effect this week. It's disturbing how much emotion/guilt/shame we attach to eating food. Since when did food become a moral issue? Regardless of how you felt eating that brownie sundae, the minute someone announces they regret it you start to wonder if you should be doing the same. Your kids learn everything from you (or until they're about 13 and become more influenced by peers than parents), but for a solid 12-13 years YOU will shape their views- on everything- including how to feel about food. Do you make those kinds of statements when your kids are within earshot? Maybe you're at the mall and they're begging you for an ice cream (or an almond pretzel with caramel dip *insert heart eyed emoji*) and you say, "No! I'm trying to be good!" Or you do get the treat and as you're all sitting there eating, you turn to your husband and say "Well I was being good today," then roll your eyes. Labeled. And your kids watched you do it. Mom thinks it's bad. Should I? Younger kids don't have the meta-cognitive skills to make that connection yet, but hearing those phrases over time? You betcha. Mothers who talk more frequently about their own weight, shape, or size are more likely to have daughters with lower self-worth and greater feelings of depression. Conversations focused on healthful eating are protective against disordered eating behaviors. Mothers who make more frequent comments about weight are more likely to have daughters who use extreme weight control behaviors (such as using diet pills, self-induced vomiting, using laxatives and/or diuretics) and binge eat. (from this article. This one is also good-- and these are just two- there are LOTS. Google it.). And now you may be thinking greeeaaat one more thing I can add to my laundry list of Mom-guilt! Don't. Pick one thing to change this week about how you're talking about food first- notice what you are saying about food. Can you catch yourself saying any of those phrases from above? Take a mental note when you do. You can't change what you're doing unless you know when you're doing it. So what DO we say about food to our kids? What DO we verbalize about our own feelings about food when they're around? How do we teach them to have a healthy, satisfying relationship with food where they don't constantly criticize themselves--especially if we ourselves are struggling? Okay, so we as adults we all know what we're trying to say when we tell them "eating that much candy is bad for you"- we're saying it's a lot of sugar- and eating sugar in abundance has adverse effects on your health and can give you a stomach ache/headache/energy crash. But that's not kid-language. We want to teach them why nutrient dense foods like fruits and vegetables will help their bodies be able to grow taller and stronger, be able to run faster, learn better at school, and even see better. Foods we would consider to be treats we can still have and enjoy- even every day if we want- but we don't eat as much of them, because eating too many treats can lead to tummy aches- and tummy aches are uncomfortable! And that really applies across the board- not just treats (I'll get to that). We keep it as simple as that. Some foods help you grow and some foods are fun 'sometimes' snacks. Even if you yourself are dieting, trying to lose weight, doing some type of cleanse or extreme diet- your kids shouldn't constantly be hearing about it. Even if you're losing weight in a healthy, responsible manner. Will they see you doing it? Sure, they watch your every move (even in the bathroom, amiright?). This doesn't mean you can't ever talk about it- all of this is about how you talk about it. It's one thing to say "I'm eating ___ for breakfast because it will help me get all the energy I need today" versus "I have to drink this shake because Mommy's trying to lose 5lbs!" I exercise daily. I have a separate instagram account for sharing healthy recipes- my kids know. It's not a secret. I can only remember Jillian asking me once, "Mom, why are you going to the gym?" And I told her it makes me feel strong and happy. Saying something like "Well, I can't fit into my pants yet since I had your sister." Or, "Remember when I ate half the cake at your birthday party last night?" You never want them to draw the conclusion that exercise is a punishment for something you ate, not a reward for what your body is able to do. If you are living a healthy lifestyle, this isn't to say you shouldn't draw attention to it- let's not confuse the two. We want our kids to learn from our healthy habits. For example, I try not to hide or sneak veggies into my kids food without them knowing just for the sake of them getting in some veggies- I want them to know they're eating a vegetable and actually enjoying it. I'll do this if I try a new recipe especially- "Did you know there are carrots in here? I didn't know carrots could have that flavor, did you? Carrots actually help your eyes to see better!" I think I actually used that exact wording once. Instead of--"Carrots are good for you- try it." Semantics? Yep. But for good reason. Keep reading. Over years and years of humans using this word- it now has a lot of really crappy baggage- guilt, shame. All of the phrases above make you feel guilty about what you either are or aren't doing. You're reinforcing all of the negative! Using the word "should" actually decreases your effectiveness. Instead, try focusing on the benefits of why you want to do that particular thing (or don't). I should really go to the gym this morning. When I go to the gym, I feel great! I should have picked the scrambled eggs instead of the donut. I will have more energy in a few hours if I eat eggs now and save eating a donut for another time. (Even if 'another time' is a few hours from now). If you're offered a treat and don't want it for whatever reason- don't say "No, I shouldn't..." For one thing, you are allowed to just say "No thanks." Or if you feel that may be rude just ask for a baggie to take it to go. I love this article on the word should and what to say/think instead. How does this relate to modeling a healthy relationship with food? Everything! I shouldn't be eating that...You should eat your vegetables- all the things we say about food. We want our kids to think in terms of what they can do- what gets them closer to their goals, whatever those may be, instead of their first reaction implying something they're already not doing because they should be doing something else. Chances are, if we're doing it, they're doing it too. I did say we do have our kids try everything on their plate, but does that mean they have to like it? No. If they don't like it, I don't make them eat it. (As an adult how mad would that make you if you were forced to down something you genuinely didn't like?) Does that mean if they don't like it, it's the last time I'll serve it to them? Not a chance. Our taste buds change over time. Sometimes kids prefer a food cooked one way over the other. My kids hate cooked broccoli, but raw broccoli? They literally eat by the head. The prefer carrots cut into "crinkle chips" over baby carrots and eat three times as many that way. Letting them have a little more control about what they decide they like and they don't like helps them listen to those body cues. Studies show that kids need 5-10 exposures to a food before they actually even know if they like it or not. (You know like when your 6 month old gags on bananas the first time but then it turns into their favorite food?) They also just may need it served a little differently from how your adult meal is plated (my kids prefer things 'deconstructed' over mixed- like casseroles and salads). Experiment with the way you serve things, let them help in food preparations- these are all precursors in establishing healthy habits. Focus on what your body can DO over what it looks like- always, always, always. For you and your kids. Instead of noticing your daughter has slimmed down after joining swim team, say "Hey I noticed your lap time has increased! You've been so dedicated with practicing." Even with yourself, if you lost 5lbs, cool, but focus on what you can now DO because of it- maybe you can do 5 more push-ups than you could last week, or hold a plank for 10 more seconds. Maybe it's even a simple as running up the stairs without getting winded. If your daughter looks smokin' hot in her prom dress (first of all, probably don't buy that one ;-), but tell her how confident, and happy she looks. WHEW. That was long. I could keep going, but those are the main things on my mind! 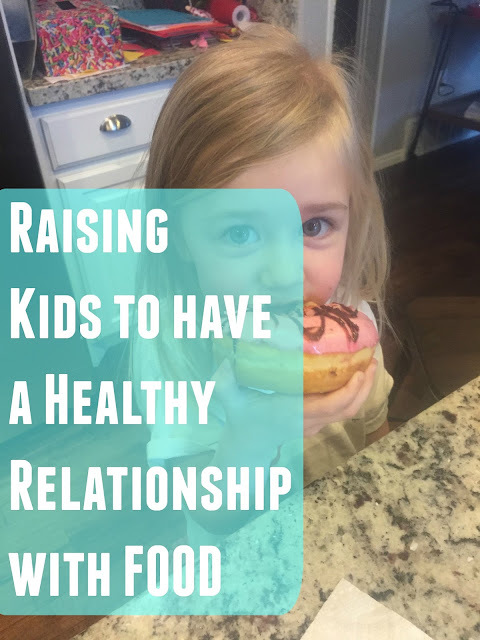 We teach our kids how to tie their shoes, why it's not polite to push a kid off a slide, why it's important to go the dentist- why wouldn't we teach them about how to have a healthy relationship with food? Because the opposite? The effects of an unhealthy relationship with food are far-reaching, emotionally scarring, and impact every facet of your life- if you've been there, you know. I want more for my kids. Is it fire-proof? Will they still grow up thinking they're too fat, not as pretty as the next girl, hating themselves for the Oreos they ate? Maybe. We can't control it all, as much as we want to. But we can help change the conversation- and Mamas- it's GOT to start with us. Extremely very informative content. The best part is Positive body-talk. Please keep writing and inspiring people's.